Our one hour standard Lava Tunnel tour during the evening time. Enjoy the magnificent cave Raufarholshellir under the stars and perhaps the Northern lights! The standard tour takes approximately 1 hour and this evening version isideal to combine with evening activity such as Northern light hunt or dinner along the south coast. Navigate through the wonderous lava tunnel Raufarhólshellir, one of the longest and best-known lava tubes in Iceland. 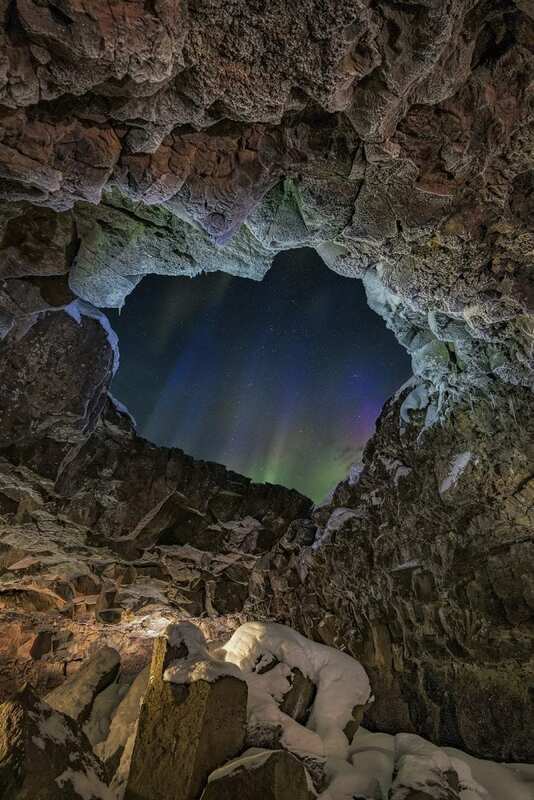 Just a short 30 minute drive from Reykjavík, this natural wonder is easily accessible all year round. This winter (´til 15th of April) we will have staff on site during the evenings and we can therefore offer travel agencies and passengers access to our standard tours after regular working hours. Evening reservations are open to the public but reservations must be done at least 8 hours in advance. Warm clothes and sturdy shoes – preferably hiking shoes.